When blacksmith Joel Bennett and his wife Julia defaulted on a loan from real estate agent Eugene Bartholomew in 1881, Bartholomew assumed ownership of an empty lot on the southeast comer of Lavaca Street and West 15th Street. Later one of Austin's first City Council members, Bartholomew was a rarity among 19th-centory Texas politicians, a popular Republican. In 1883 he spent $600 erecting a stone house on his new property Bartholomew realized a nice profit in 1885 when he sold the site to Mrs. Fannie Wayland for $4,000. After extensive renovations, including the addition of three unusual towers, Fannie's husband John moved his grocery, grain, and provisions store onto the premises. 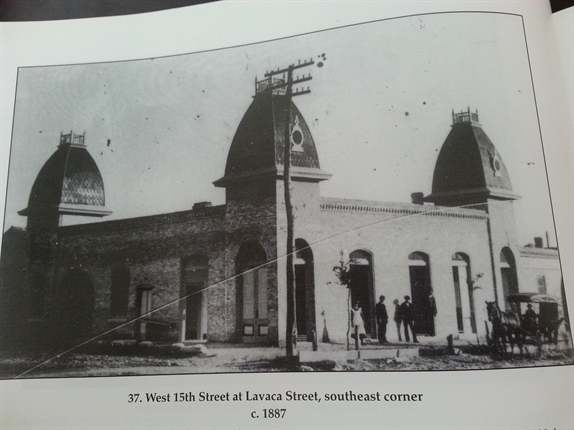 An 1887 advertisement in the Austin Daily Statesman contained a sketch of the building appearing much as it does in this photograph. By 1900 the Waylands had moved to Robertson County and sold their Austin building to tenants John Kallgren and William Lindahl. These two worked together selling animal feed until 1917 when Kallgren bought out Lindahl's share. After Kallgren's death in 1923, R. W. Shipp purchased the land and building for $16,000. Tulane graduate Shipp practiced medicine in the Scarbrough Building from 1911 until 1954. 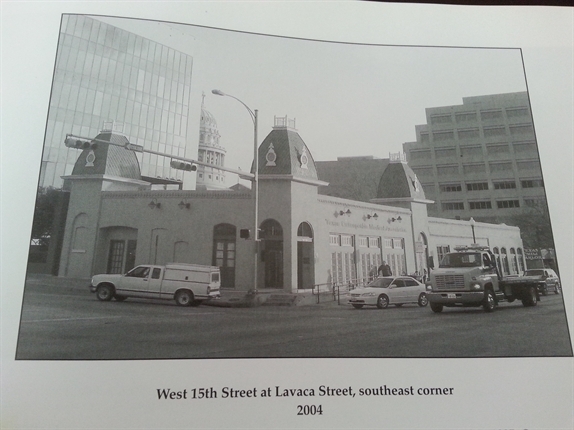 He and wife Madeline, of the prominent Robinson and Bremond families, leased their building at 15th and Lavaca to a number of different tenants over the years. At Mrs. Shipp's death in 1961, her will bequeathed the property to several of her brother's children and grandchildren. By the end of the decade the structure housed Capital Oyster Bar and The Checkered Flag. 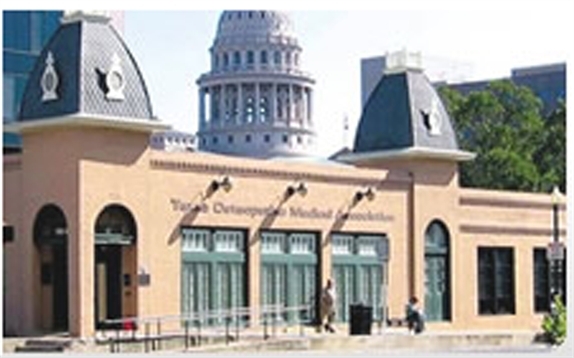 Threatened with demolition, the Bartholomew-Rosner Building was purchased by the Texas Osteopathic Medical Association (TOMA) in 1995. Once convinced of the structure's historic value TOMA invested heavily in extensive restoration. The three outside towers were rebuilt, original interior limestone walls were exposed, two original fireplaces were discovered and restored, and portions of the original Bartholomew house were uncovered and incorporated into the new design. The sanded and polished original pine flooring now in use undoubtedly conveys a different atmosphere than in the days of the old feed and grain store. See video of the beginning of the restoration project here.